Transport Ministry assurances that a “majority” of mature trees along the Attard – Rabat road will be retained when the road is widened have been dismissed by eNGO Flimkien Għal Ambjent Aħjar. In a statement on Monday, FAA and its FAA Tree Group subsidiary noted that plans approved by the Planning Authority clearly showed that 79 per cent of the 586 trees in the area would be removed as part of the €55 million Central Link Project. It also brushed aside promises to “transplant” some of the trees, noting that “Aleppo Pines do not take to transplanting, and experience has shown that Malta lacks the maintenance ethos that such a long-term operation requires." 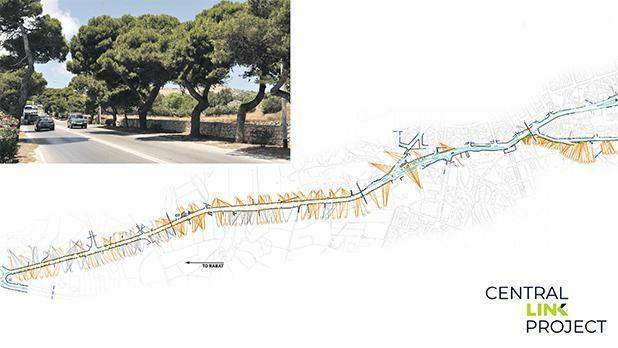 On Saturday, Times of Malta revealed plans to remove up to 200 mature trees as part of the roadworks project. That prompted a ministry denial and assurance that a "majority" of trees would be kept. Many of the trees destined for the chop are around 100 years old, and some could be much older. The trees form part of the Mdina skyline vista which as featured in films such as The Malta Story. “No civilised Western country would ever contemplate such destruction of national heritage and undermining of their tourism product – it is the equivalent of running a motorway through the Cotswold villages, to Assisi or to Mont Saint Michel,” the FAA thundered. While arguing that studies had repeatedly show that increasing roads only encouaged more car usage, the FAA also offered some alternative suggestions for plans submitted to the PA. The section from Mount Carmel hospital to Saqqajja hill was already wide enough to accomodate three or four lanes, the group argued, and the Saqqajja Road did not need widening since the major bottleneck was the Attard junction to Żebbuġ. FAA said it would not reman silent while Malta’s tree heritage was wrecked. In a Facebook post uploaded on Monday afternoon, PN MP and environment spokesman Jason Azzopardi said he had formally asked parliament's Environmental Committee to put the issue on the agenda. He described the ministry's proposal as one of "unprecedented tree destruction".